​Get Your Online Presence in Shape! Struggling to get your new business lucrative? Striving to grow your existing business? Learning how to build an online business? Our specialized one-on-one hands-on consultations enable our students, which we recognize as "comrades", to kick-start their websites, careers, & reputation, online instantly. We offer top-notch courses on internet marketing to our entrepreneurial minded base of comrades. At Internet Business Boot Camp, we teach the steps involved in preparing a robust internet marketing strategy and selecting a target audience for your marketing plan. We excel in developing a business strategy from scratch, as well as integrating aspects of digital marketing into existing marketing plans. ​An Experienced, Trained, and Dedicated Consultant. Get Your Most Demanding Business & Marketing Questions ANSWERED Live! Recordings uploaded to "Comrades Section"
Whether you're an entrepreneur, business owner, or internet marketer, Internet Business Boot Camp is your way to learn how to effectively market your company, your products, and your ideas to anyone! Q? How much do your consulting services cost? A. Our initial cost with current promotions is $1,797.00. Continued membership benefits cost $199.00 per month beginning 1 month after initial enrollment. Cancel anytime. Q? What’s included with your services? A. After completing our New Client Questionnaire, we'll determine together the best areas we should target to increase proficiency. Our assistance ranges anywhere from hands-on-training with basic computer program such as Microsoft, to creating your own website, brand development, or even professional management. We can provide consulting in almost any area in business or online marketing. Depending on your purchase we'll provide monthly consultations until our objective's accomplished. Q? How long are your consultations? A. Our introductory consultations are either 1 hour or 30-minutes long. After the introductory consultations our Comrades Club monthly consultations are 30 minutes long. Q? How do these consultations take place? A. We will conduct all consultations over telephone along with the ability to use Join.Me, a screen sharing program, when needed. These consultations with be with a real experienced trained consultant of Internet Business Boot Camp. Q? My company has proprietary information, do you sign non-disclosure agreements? A. Of course. We take pride in our professionalism and discretion between our clients. With our wide clientele, our Quality Assurance department monitors communication between clients to ensure there is no violation of client privacy. Any information about you, your company, consultations, ideas, or plans will always remain confidential. Q? I don’t think your services will benefit me. A. Internet Business Boot Camp brings a new fresh perspective. Companies experiencing difficult times need a fresh set of eyes. Companies experiencing rapid growth may not see the inefficiencies in their systems. Individuals inside of the company may be incapable, unwilling or afraid to provide the pragmatic advice that we offer. Critics say that consultants are only selling "glorified common sense"; however, for employees who are bogged down with their daily routines, it's easy to lose a critical eye for analysis and improvement. Q? What if I am too busy for these consultations? A. No problem! We'll always try to schedule any consultations around your time requests. Please contact us, as soon as possible, if you're not going to be available during a scheduled consultation. We can always re-schedule you! Just try to make sure you cancel any scheduled consultations at least 48 hours before your scheduled consultation, we do enforce a cancellation fee to avoid re-scheduling being abused. Q? Do un-scheduled or missed consultations roll-over? A. Unfortunately, due to billing complications, we do not offer the ability to "roll-over" any un-used, un-scheduled, or missed consultations. For this reason, we highly encourage fellow comrades to participate in the weekly webinars for informational refreshers and updates. Our team can show you how to implement effective, reliable, and affordable marketing strategies to put you in the right direction to meet your business needs. 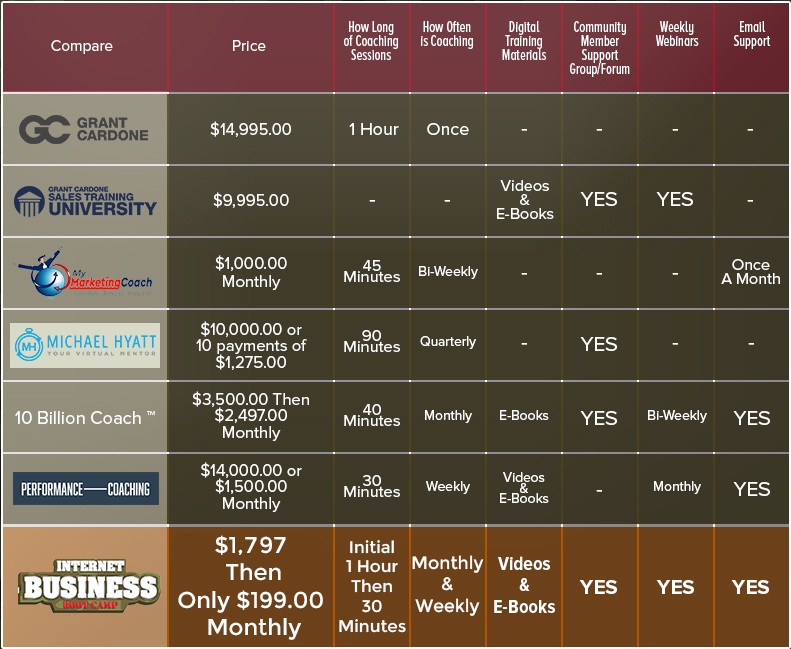 © 2019 Internet Business Boot Camp. All Rights Reserved.